Horses drawling load: "Redding Iron Works Catalog Photo. 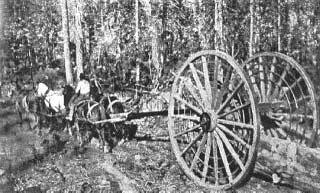 Couresy of John Webb Jr."
In the late 1800s, when lumber was king, the wheels of logging progress literally turned on their axis with the invention of the High Wheels, or big Wheels, as they were known back then. In 1875, a local wheelwright by the name of Silas Overpak in Manistee, Michigan, claimed he originated the design for the wheels when a farmer asked him if he could fashion a larger set of wagon wheels. The farmer returned some months later and asked for an even larger set than the eightfoot high wheels he had made for him. Curiosity led Overpak to inquire what they were being used for and the farmer replied "Skidding logs".1 Overpak quickly saw what a profitable niche the wheels could be in the logging industry. He unveiled his "Michigan Logging Wheels" at the 1893 World’s Fair in Chicago, where they were a huge success even though there were at least 25 patents registered for the wheels at the time. The wheels — 9 to 11 feet high and weighing between 1,200 to 1,500 pounds — were ordered and shipped by trail to lumber companies across the U.S. A design change came at the turn of the century when John Webb Sr., owner of Redding Iron Works in California, developed, patented and manufactured his Slip Tongue High Wheels. Unlike Overpak’s stiff "stinger" tongue, the slip-tongue was a vast improvement in that it provided better braking over steep slopes2. According to the Society of American Foresters History of High Wheels, when a team of horses pulled on the tongue, it slid through the hounds, which pulled the Jacob Staff (a rotating rod and lever system) forward, thus rotating the cams and raising the logs off the ground. The tongue floated through the hounds about ten to twelve inches off the ground. On downhill slopes, the wheels and axle slid forward on the tongue. With this forward motion, the cams rotated backwards, lowering the logs to ground level, which acted like a brake. 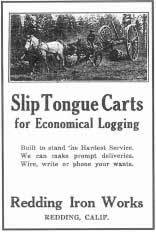 Aside from not having the heavy load of logs in the cart outrun its valuable team of horses, logging companies found that they could pull over one thousand board feet of lumber with the slip tongue as opposed to six hundred with the older style. Some of the bigger mills ordered as many as fifty sets at a cost of $350 per set. By 1915, Redding Iron Works had developed a cast steel Dodge-Style hub that could be unbolted and broken spokes replaced within hours. This style was used up until 1932. It is true that High Wheels were horse or ox driven, but steam power was just around the corner. In the late 1800s, Daniel Best invented a steam traction engine.3 In 1910, when he retired, his son incorporated his own company, the C.L. Best Gas Traction Company, in Elmhurst California. By 1913, he developed the first track-laying tractor. His company finally merged with Holt Tractors in 1925 to form the Caterpillar Company. Interestingly, it was the "new" gas powered Caterpillar tractors that eventually caused the demise of the logging wheels by the mid-1930s. 2Personal interview with John Webb, Jr., March 27, 2003, who also provided archive photos and catalog. 3Daniel Best, a Biography", by Brent and Dr. Terry Galloway, great-grandsons of Daniel Best. Dr. Galloway worked thirteen years to acquire and restore the Best steamer, which is now housed at Ardenwood Historical Park, Fremont, Calif. Rob Burg, site historian for Hartwick Pines Logging Museum, Grayling, Mich. John Webb Jr., Redding Iron Works, Redding Calif.
Dr. Terry Galloway, Berkeley, Calif.